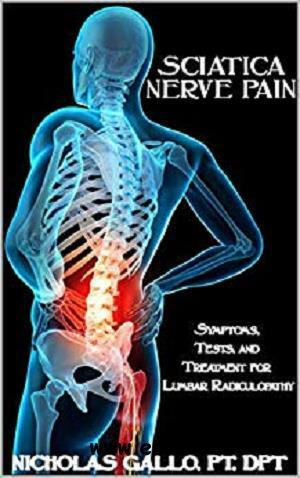 Sciatica Nerve Pain is a debilitating condition that can make a person feel helpless. This excruciating pain extending from a person's lower back and sometimes as far down as their foot can be life changing. Many people are affected by Sciatica and feel as if nothing but surgery can help them. In my experience as a board certified Doctor of Physical Therapy, I have seen that there is a lot of misinformation out there regarding this condition. Therefore, my goal with this publication is to educate people who are suffering from Sciatica and help them get their normal lives back. Most often, people can be helped tremendously with conservative treatments however they are unsure of what to do to accomplish this. The treatments that I have included are clinically proven in the research community and in my own personal clinical experience. I describe these treatments in detail and show their appropriate progressions. I also list my free supplemental videos for the exercises talked about on my YouTube Channel: Physical Therapy 101. The videos not only show the exercises but show how to correctly perform them which is essential to recovery.Sciatica Nerve Pain does not have to be debilitating, it can be treated effectively with conservative management. With correct treatment, people can return to their daily lives without being affected by this condition.